Just been to Portsmouth to pick up a pair of high heels from Debenhams. This also gave me a chance to have a look around other shoe shops. It did seem to be a good time to shop. Shops not being that busy. Since I was in Debenhams I had a quick look around the shoe department. Didn't find anything in my size. I am a size 9. I think most stores these days expect you to ask a sales person for the size you need. My next stop was Next. This shop seem to have a small shoe department. All the shoes had plastic sizing tabs on them. At least that made it easy to tell what size the shoe was with out the need to pick them and look at the soles. Both B.H.S and D.P. had all shoes in size order. I seem to remember D.P going up to a size 9 but had none on show. New Look.. Last time I went here the shoes were on the left hand side of the store. All sizes being mixed up. I did buy a pair last time, thanks to a helpful sales woman. This time at the back of the store in the right sizes. Size 8 and 9 being group together. No size 9 again. I think people buy size 9 on sale and resale on Ebay. I did try a couple of size 8 on but didn't fit but, under £10 for each pair seem worth trying on .I sometimes see a size 9uk marked up as a 42euro as well These size 8 were marked up as a 42 euro as well. Didn't have much more to left to do any more looking around so went home. The problem with New Look is that they only get one pair of size 9 for each style delivered to store. According to the staff in Preston it depends on who the manager is and what they will reorder, some stores sell more larger sizes than others. Ive always found that the High Wycombe new look is good for size 9 availability! Isn't ordering on-line the simpler solution to buying shoes if you can't find them in-store locally? And for those of you who would prefer that new shoes aren't delivered directly, perhaps the "Click and collect" facility that is becoming increasingly available? I did try to buy an ideal pair of high heel boots from the next website a couple of years ago but for some reason would not allow me to collect in store. Until last November I hadn't bought a pair of heels for around 10 months. Then I bought 1 pair of Ebay then a week later 3 pairs from the same seller.I don't like having to many parcels delivered to me. I was going to go and collect them but the seller was able to do a 24 hours delivery for me. I was home alone that day. So that work out well. 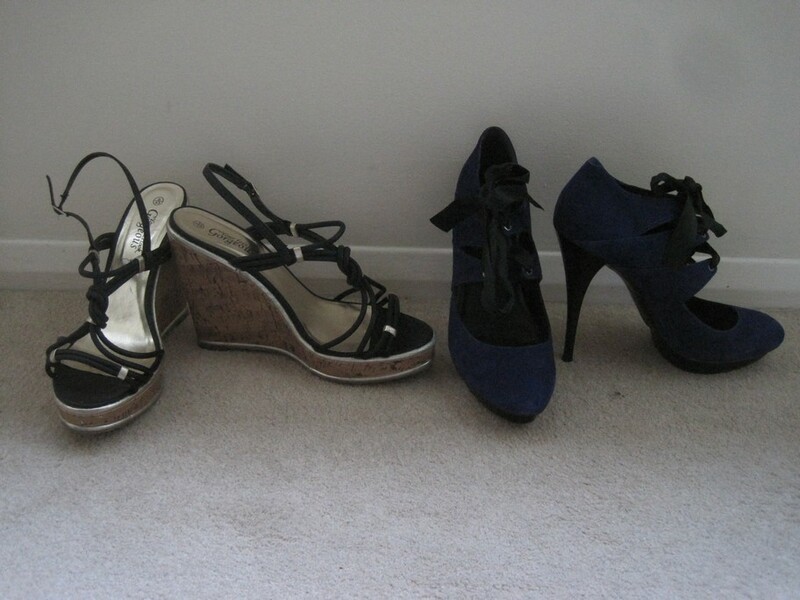 I have sold all the heels that i need to sell Ebay but thinking now on selling another 2 pairs later on in the year. I pair I,ve damaged the heels on and don't wear much. The other pair are just to big but do like them and also don't wear them much. When I buy I always want NOW, thats why I usually buy in store plus I always try on to make sure that they fit. I bought a pair online many years ago, waited for them to be delivered and then found they didn't fit. After all the hassle of sending them back and awaiting a refund I decided to shop in store where possible. Another free listing weekend on Ebay. Going to try to sell a pair of mules that don't fit Going to see I can get most of my money back. I expect they wont sell. If I had the choose I would try on in store and buy cheaper on line. Or buy one pair in store and try on other pairs in case they turn up cheaper on Ebay. I try not to buy full price for my heels now. Have in the past bought size 6 on Ebay and bought them cheap. 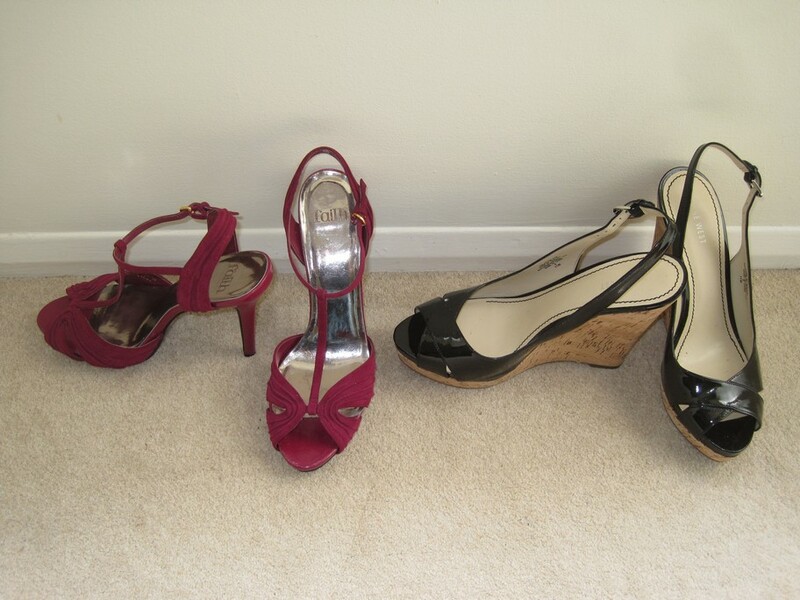 Just to many size 6 on Ebay and buyers can choose what heels to buy. Could be the same with size 8 as well. Wanted to bid on a pair of suede court shoes from Faith on Ebay. Most of the time you get last minute bids as the auction ends. As I was at work when the Auction finish I tried to use my phone but could not get a signal. I would of won them as no more bids come in at the end. I can't say how many items I didn't win, just because I forgot to bid at all. Most of them went through the first time they were listed, with no bids at all from anyone. Next time around (for some reason) not only did people bid, but usually bid above my maximum. That said, I did snag a pair of boots with 5" heels for silly low money, with the seller advertising them as PU, when I knew they were leather. (As I already owned two pairs.) Seller was happy with me, as they got a bidder, I was happy, as I bought my third pair for less than half he price I paid for the previous pair(s). Borrowing a tagline from another brand; "You have to be in it, to win it." Just bought a pair of snakeskin knee-high boot from Ebay. No last minute bids this time as well but was able to get an signal this time. Starting to think bidding during work hours work best for buyers since item sell for less. I had bought a pair of leather D'orsay heel on Ebay last year. Hadn't worn them much due to them being tight and not being able to walk in them. Been able to wear them for around 2 hours tonight so might be able wear them. Been goimg through my collrction of 30+ heels. Able to wear them more now Have made my mind up to sell a pair of ankle boots and knee high boots Just didn't wear them Will sell them later on this year. Also have a very nice pair of high heel sandals in white from Fredircks of Hollywood that I will sell in the next few weeks. . Ideal sandal for the summer. Reason I,m selling them as they are 1 size to big for me and my feet move about in them. The heel itself is higher then my normal heels that I wear but able to walk in them fine. I,m sure that I had problems walking in them before. I did wear another pair of black sandals last night that I was thinking of selling. This pair from highest heel collection with a heel almost 6 inches but still able to walk in them fine. This pair of heels also 1 size to big for me but they don't feel loose on me, but look too big on me.. Will be keeping them for the time being. I have decided to keep both pairs at the moment. Also bought 3 more pairs in the last month. Very pleased with all 3 pairs that I bought from Ebay. I know I have not posted the 3rd pair. This is due to the fact there is a very small upload limit on posing photos on here. Liking the pair on the right. I had a similar pair, but sold them as they were too tight. I will buy another pair to replace them though. Bought this pair last month. Make is Tilly of London. Bought in a size Uk10. Sort of thing I like to wear late at night. Nice. I have a pair without a platform. I like the look when I fold the top down abit. Enjoy wearing them. Been busy buying all sort of stuff from Ebay. Another 2 pairs from Ebay. Pair on the left from Faith I have another pair from Faith that are very comfortable to wear over a long period. This pair very similar in height width and fit and are both T-straps in style but this pair not as comfortable as the other pair. The pair on the right cost the seller £105 new. I bought them on a best offer for £25. Came new in box with the wrapping still in the shoes. My first pair from Nine west. Not sure if the shoes are better made then other makes such as Faith, New look etc. Not sure I would buy a pair of heels costing £105 knowing they were made in China. Couple of years ago I bought a pair of strappy silver sandles on Ebay for around £25. 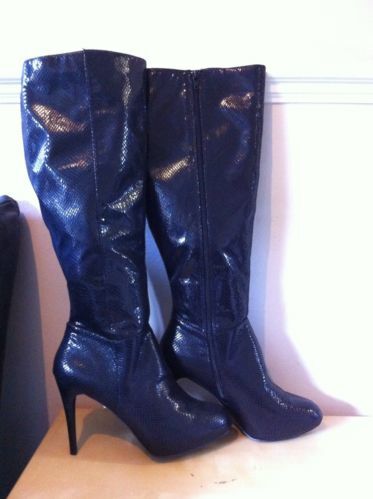 Just seen the same pair in black and the seller is asking £50. I think that's more then the retail price was in the first place. The New look wedges I bought couple of months ago have turned out to be one of my best pairs I own now. Have bought another two pairs this week and will post photos of them later. I'm selling rather than buying at the moment. Last week sold my blue pair of Lois from Schuh, (same as red ones in my avatar) and this week I've put the stone coloured ones up for sale. I expect the black ones will be next. I am thinking I want to be buried wearing the red ones - in about 40 years hopefully! Like the look of those boots. I would like a pair of the Lois shoes, but the pair you are selling would be to big for me. I like the look of the Kurt Geiger boots. If they had them in a knee-high version (or my size) I would consider them. I would like a pair of the Lois shoes, but the pair you are selling would be to big for me. They are popular. Come up a size small, which I've mentioned a few times, but I know you have small feet. I have to say I'm not big on boots, but I'd like to be. I've got legs like cocktail sticks. If I remember, my calf measures 13 inches. What got me back into heels was a pair of OTK boots made out of what the fashion industry refers to as 'scuba' material. [Has the look and feel of neoprene.] Currently quite popular for pencil/hobble skirts, and I have 2 pairs of leggings from Marks and Spencer made in the stuff. Feels 'delicious' to wear. Anyway ..... The OTK boots were tight to my legs and I can only describe wearing them as feeling like my legs were being caressed. I wore them out very quickly, in about 5 weeks I think. Wore them for days at a time..... At around £25 they weren't expected to last. 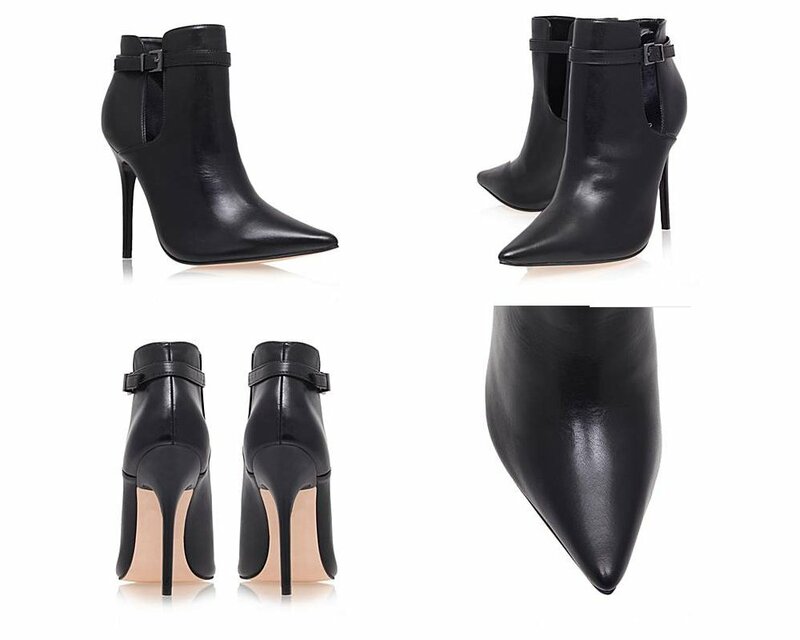 If I could get some boots with the "Get" shoe shape and heel, under a scuba type OTK or thigh boot, I doubt I'd buy another shoe. Not holding my breath on that one though. I'm a size 6 wide, but usually wear size 7 (even in ladies shoes). Do you think they would fit me ok or would they be to big? If they would fit I would happily take the black pair off you. Do you think they would fit me ok or would they be to big? They are not an 8, that's for sure. Reviewers claimed they were a 7, and I would agree. A week or so ago I bought for £12 (and returned) some Primarni sandals, in a size 7. Lovely and high, and the right size for my feet..... But what would pass for the toe-box, was way way too big. I would say I'm usually an EU41 slim. As long as I'm not just out of a bath, or not cooking hot from the warm weather we have at the moment, I can get my feet in these shoes. (And best if I've worn heels for a couple of hours earlier to get my feet in 'pointed court' shape.) These shoes are marked '41' and they are definitely slim in fit. If you are over this way, you are welcome to try one on. I was over your way yesterday morning, collecting some shoes from the repairman.